It has not been that long since the Dark Souls Trilogy launched on the PS4 and Xbox One. If you are a huge fan of the franchise and what FromSoftware is doing, then you most likely picked it all up again to play through all of the titles. Now, almost three months after that launch to the Dark Souls line it looks like Bandai Namco will be offering fans a new collector's edition for the game. This seems like an odd move to do, but if you have a spare £449.99 (~ $578.94 USD) sitting around you can snag this beefy looking bundle. You also need to be based in the European area to be able to pick it up as well. This new bundle for the Dark Souls Trilogy will house the three remastered titles and all of their DLC to date as well as a soundtrack from the franchise, a 460-page compendium, and a 34cm (~ 13.5 in) Elite Knight statue. All of the statues are hand painted and numbered with the limit of 2000 being made. That by itself could warrant the price tag, so take note if you are a super fan of Dark Souls and need something to make you stand out from the rest. You can have a look at what should be coming in this set when they start shipping later this year and spaced out given the time needed to do all of the painting. 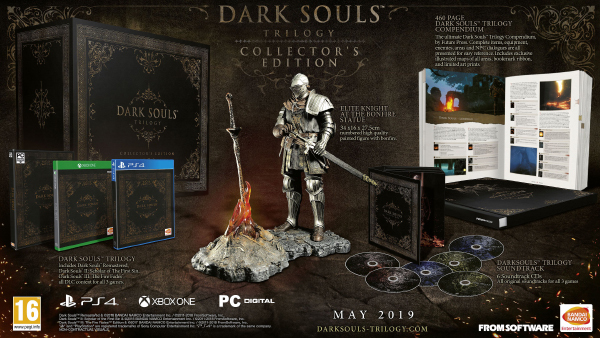 From 31st May 2019, Dark Souls fans will be able to own the Dark Souls Trilogy Collector Edition — including all three critically-acclaimed Dark Souls games and associated DLC — for PlayStation 4 and Xbox One. The Dark Souls Trilogy Standard Edition — featuring all three games, DLC and digital soundtracks — will also be available to purchase from 1st March 2019 at participating retailers. Since its initial release in 2011, the Dark Souls series has enthralled fans across the world with unique and unrelenting gameplay, intricate world designs, deep-rooted lore, asynchronous multiplayer and challenging difficulty. Players can now own the entire series along with all associated DLC in one package, with localized texts in English, French, Italian, German, Spanish, Russian and Polish. Will you be looking to secure this version of the Dark Souls Trilogy now or is it too much too late? Is it odd to you that it would take this long to get the collector's edition or is it another way they are punishing their fans? How different do you think each will look or will they still look about the same even with the hand paint job? Let us know what you are thinking down below. When there is more to share for Dark Souls in general, we will have it all here. Stick around.